A belief is a thought you keep thinking! 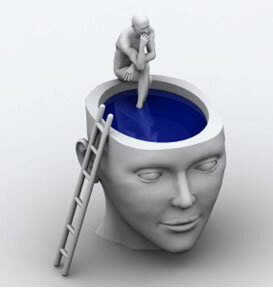 Beliefs may be conscious (you are aware of them) or unconscious (you are unaware of them). Most of our original belief programming was created in childhood and is now unconscious. As much as 92% of our beliefs are unconscious. So what are you choosing to believe? why are you choosing to believe it? and who are you believing it for? Our body (hardware) is running a program (software), which creates behavior (print outs). As young children, we are in programming mode (software being installed), recording everything around us using all of our senses. Beliefs are created as we take in or record the thoughts, feelings and opinions of others, or as we label our experiences, usually without discernment. So for the most part we accept what we see, hear, feel and experience, as the truth. These “truths” then consciously or unconsciously run our lives (software programming running the computer). I hold that these unconscious belief patterns “direct” us to create experiences that are in line with those patterns. It’s as if we seek out experiences and people that match our programming (beliefs) which may be either positive or negative. So, we are operating our lives with programming (software) that we didn’t really choose, based on beliefs that may not be true or even part of our conscious thinking! We can “record” false beliefs because of our naïve interpretaion of the situation or experience. For example, I created a belief that “I am not good enough” as a result of my dad working a lot. When I was a child, I really wanted to play with him and couldn’t understand why he wouldn’t. I then decided that I was not good enough for dad to come home early enough to play with me. I didn’t really know how to communicate my needs and understand a father wanting to provide for his kids in the best way he knew how. A client struggled to enjoy food and eating – she simply found it unpleasant. In the process of discovering her unconscious beliefs, she realized some dramatic “programming” she had created from a simple incident at kindergarten involving a jam and peanut butter sandwich. This incident made her question who she was and create beliefs that have caused her stress around food for over 30 years. Another client found herself not being able to ask for anything or voice her truth in her life. She grew up with a very demanding older sister and her parents gave her as much as they could, but often at the expense of the rest of the family, which caused some financial and emotional stress. My client was very aware of this dynamic at an early age and did the opposite: she didn’t ask for anything as she noticed the stress it created for her parents. This was reinforced when she was 8 years old and she finally asked for something really important for Christmas – a purple unicorn that she saw in a store. She asked for it over and over for months. When Christmas arrived there was only bitter disappointment. This experience became a powerful reinforcement that “I can’t ask for things”. So in her adult life she put her own needs last. Never asking for help with difficult tasks, nor asking for the return of items she’d she’d lent to friends – she even found herself doing a job before asking what her salary/benefits would be! Identifying her false belief that asking for things would burden others created an awareness that, as an adult, she could make new, conscious choices….. or better yet ASK conscious questions. She now gets her stuff back! So think of me, the Abundance Guy, as an internal computer programmer of sorts. I start by assessing a client’s overall functionality (operating system), identify where the obstructions are (software conflicts), introduce new life skills and reprogram self-beliefs (upgrade the software) and set you on a path to optimal functioning (reboot your computer to effect the newly installed changes).